River City Extension formed in 2007, and has released two full-lengths and numerous EPs and splits including a 2011 split with Kevin Devine. Paste named the band a “Band to Watch” in 2010, and NPR has hailed the band's “serious ambition”. Three years after the release of their critically acclaimed sophomore album, Don't Let the Sun Go Down on Your Anger, Toms River, NJ band River City Extension released their latest full-length album, Deliverance, March 10, 2015 on Anchor & Hope Records. Deliverance is comprised of ten tracks that successfully create a succinct, effortlessly executed indie rock opus reminiscent of Tom Petty, Paul Simon, Girls and Dirty Projectors. While guitarist/vocalist Joe Michelini originally served as the core of River City Extension, Deliverance sees Michelini and long-time collaborators John Muccino (guitars/vocals/strings) and Patrick O'Brien (keyboards, vocals) expanding into a full band with the addition of members Josh Gilman (bass) and Steve Tambone (drums). Opening the night in the 7th St Entry will be the talents of Cold Fronts and William Within. After staking claim as vets in Philadelphia with a dynamic live show, Cold Fronts became last year's winners of the Jansport Battle of the Bands contest at SXSW – a feat that sparked interest from Warner Bros. executive & Sire Records founder, Seymour Stein (The Ramones, Madonna). The band's Forever EP was produced by Kyle Johnson (Wavves, The Hives, Modest Mouse, So So Glos) and captures the band's signature garage sound with a dose of surf pop and juts the right amount of polish. It's full of songs that will take up residency in your brain for days, if not weeks at a time, thanks to the unforgettable harmonies and lingering melodies. It is comprised of songs that you will find yourself humming along to, long after you shut them off. Formerly the solo project of Alexander Simpson, William Within is now an electric folk quintet based in Minneapolis. The group's sound is laden with unique guitar tunings, whispery vocals and spacious string arrangements, often earning them comparisons to Grizzly Bear, M. Ward, Destroyer and Nick Drake. William Within consists of Alexander Simpson on vocals and acoustic guitar, Tom Steffes on electric guitar, Derek Rohlf on violin, Matt Blake on double bass and Toby Ramaswamy on drums and percussion. Supporting the act Tuesday will be Heaters, formed out of Grand Rapids, MI since the summer of 2013 when they started working on a project together. The group has drawn acclaim across the webosphere for their spacey, driving take on West Coast psych rock. Tapping into both the twang of their ‘60s garage compatriots and building their own brand of expansive, cosmic swells, Pitchfork calls the band “catchy and kinetic,” noting their “energy and hook writing are clearly on point.” Combining a seemingly constant output of “reverb coated, fuzz studded, hard driven garage psych” with a kaleidoscopic, hip-shaking live set, Heaters are quickly forging something new and exciting. 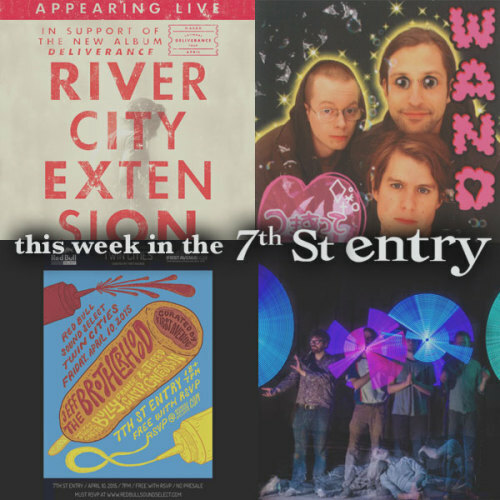 Phantom Tails will be starting the night off in the 7th St Entry. The band is a deep-space doom-funk quartet hailing from Minneapolis, MN. Using vintage drum machines, analog synthesizers, fuzzed-out bass, and commanding guitar, they have developed a distinctive sound that makes you think and dance simultaneously. Cheeky, charming and touchingly direct, Melbourne foursome Twerps are international lo-fi pop champions. Formed in late 2008, Twerps were already supporting the likes of Deerhunter, the Bats, the Black Lips, Yo La Tengo and Thee Oh Sees within a few months of their first gig. The band appeared at SXSW in 2012, getting written up in the NME, Blllboard and elsewhere, and then toured the US with well-known buddies Real Estate in April. A series of sold out Aussie dates in August followed, with Twerps heading back to the States again in October for CMJ, plus a State-wide tour supporting their brand new single "Work It Out". The new single was thrashed on BBC6 by Marc Riley, and scored an NME review as well as high rotation on Triple J. Twerps triumphed over summer at Meredith Music Festival, welcomed new drummer Alex Macfarlane in early 2013, then spent much of that year recording album number two. They took time out for the likes of ATP's Release The Bats festival and some sold out shows with Mac Demarco and shined on the national Laneway Festival tour in 2013. The rest of the year saw them appear as surprise guests at Release The Bats festival, and play sold out shows with Canada's Mac DeMarco in Sydney and Melbourne. Twerps signed to Merge Records internationally in 2014 and released effortless eight song EP Underlay in August. Their much anticipated second album, Range Anxiety, was released in January 2015. Range Anxiety is a worthy showcase of the creativity and vitality Twerps bring to their music. At first listen, nods to The Go-Betweens and the band's beloved Flying Nun influences are clear, but upon closer examination, Twerps expand into a sound uniquely their own. Special guests for the night include Real Numbers, Larry Wish & His Guys, and DJ Shawn Reed. Real Numbers is a Minneapolis trio is tethered to making (distant) pop songs, in a mold that confines them to be terse and bright, sounding like the Desperate Bicycles or even Swell Maps. Larry Wish is a local recording artist who also can make some videos with the band. His band, "His Guys", plays with him on occasion. With over 30 albums under his belt, Larry Wish will keep doing just that. To get the night going, DJ Shawn Reed will be spinning beats as well. Just 21 years old but undeniably an old soul, Max Jury comes on like the missing link between Gram Parsons and George Harrison, shot through with the grace of James Blake. An impeccable song-crafter, he's got one foot in the cornfields and the other in the nearest dive bar whilst his fingers skip across the keys of his Fender Rhodes. An Iowa native, he binds together timeless themes of the struggles of being young, drinking the bottle dry and love lost and found with a small town perspective, topped off an airy croon that's bound to break as many hearts as it heals. Though he's a fan of the lovelorn stories of Hank Williams and Lefty Frizzell, don't be too quick to pigeonhole Max as a country musician himself. He calls his sound “a big stew”, which also encompasses his love of rock'n'roll and British invasion bands like the Kinks as well vintage soul, modern pop and contemporary roots music. As a live proposition, Max either plays solo or with a full band made up of friends and ex-lovers, who made their debut at a sold-out, 2000 capacity venue supporting Lana Del Rey, after being flown out to Chicago personally by Tom Windish of The Windish Agency. For anyone looking to enjoy some great vocals, Max Jury is a must-see show. Opening the act Thursday will be Bonzie, the moniker for 18-year-old Chicagoan Nina Ferraro, who isn't a traditional confessional singer-songwriter. She's more of an observer and commentator who is drawn to expressing the concerns of her generational cohort (the bond between independence and interdependence, not wanting to be manipulated, view of one's self beyond society) with unwavering honesty, and delivering them with powerful abandon. It's partly for this reason that Ferraro has chosen to release her songs under the moniker Bonzie (an image and word she's long associated with her creative output) as opposed to her own name. The best rock 'n' roll, the kind that gets under your skin and makes all your senses heighten, is simple and comprised of hard work and unrelenting passion—all of which is JEFF The Brotherhood. Brothers Jake and Jamin Orrall have been playing together since they were little kids and formed the group when they were in high school. The boys grew up with a voracious appetite for any music they could get their hands on. The band incorporates a DIY ethos in everything they do, including their raucous live shows. The band has been touring tirelessly for the past 10 years, playing any and all conceivable venues—from basements and backyard sheds to Bonnaroo and The Bowery Ballroom. The duo clocked in over 400 shows in the past two years alone and have shared bills with Best Coast, Fucked Up, Pentagram, The Kills, The Greenhornes and more. When it comes to creating their desired sound, JEFF believes that less is more. This idea is reflected in Jake's decision to play a guitar with only three strings. Jake explains, “When we started the band, I didn't know how to play guitar," he remembers, “I thought, in order to teach myself, it would be easier to play if I simplified it. I started with two strings, but you can't really play any chords that way, so I added a third string to create this interesting limitation that forced me to create my own style and approach to the instrument.” In the end, Jake and Jamin just want to write great songs, play great shows and inspire fans to rock along with them. For JEFF The Brotherhood, blood is thicker than water—and music runs through the band's veins. RSVP for free entry! Special guests of the night will be a mix of home-grown rockers and Nashville-natives. Bully is a young Nashville four-piece blasting out of the gates with high-powered grunge punk reminiscent of the beginnings of indie rock. The band is fronted by Alicia Bognanno, former intern at Steve Albini's Electrical Audio studio in Chicago who has been cutting her teeth on the soundboards of indie clubs and studios in recent years. France Camp plays smash-n-grab to their rock n roll forefathers, blending and stitching sounds ranging from blues to surf to country twang to brazen punk. Recorded dutifully by Ali Jaafar at Ecstattic Studios in Minneapolis, the band was able to capture the torching, ramshackle energy promised from their often chaotic live performances. Finally, Stereo Confession, has been described by the Star Tribune as, "A celebration of teendom's biggest time-wasting activity set to surf-y guitars and a Ramones-ian bop." This mix of special guests leading up to the performance of JEFF the Brotherhood is set to make for an electrifying Friday night. Kind of Like Spitting was formed in 1996 in Portland, OR by Ben Barnett. Now joined by Brian Grant (Bridges Worth Burning, 100 Dollar Room, Old Moon) on bass and Dante Johnson on drums, KOLS has a solid home in its sound as a power trio. Over the band's 19 year history they have toured the United States approximately 65 times, released countless singles, EPs, compilations, and ten full lengths (Hush, Barsuk, SlowDance, Jealous Butcher...) all relatively under the radar, deciding in 2006 to pack it in. During the Hiatus Barnett released an album on Barsuk under the moniker "Blunt Mechanic" in tandem with being the Music Director for the Seattle School of Rock. With a strong cult following and a new release on Top Shelf Records entitled It's Always Nice to See You as well as multiple re-issues of older material (Barsuk, Run For Cover, Count Your Lucky Stars) slated for 2015, KOLS is touring again, making music and doing what they love. To get the night going, Lee Corey Oswald will be taking the stage. The band got their start in the vibrant and vivacious punk scene of Scranton PA, alongside bands such as Title Fight, Tigers Jaw, and The Menzingers, before relocating to Portland, OR in 2009. Though they inevitably drew influence from the laid back elements of a West Coast lifestyle and the indie/folk scene of Portland, their sound never shook that sense of emotional urgency and intensity that is so familiar with bands out of the Northeast. Lee Corey Oswald have crafted a collection of twelve intriguing indie-punk classics all on one record. The band's clever, honest and thought-provoking lyrics combined with their 90's-esque indie sound, recall bands like Weezer and Knapsack, while their contemporary edge adds a dash of grit to the musical landscape of Portland. Regards was recorded analog on reel to reel tape, capturing the band's spirit in the moment as they perform each track live to record. There are four boys who make up Reptar. They have offered twice as many (if not more) explanations for why they chose to name their band after a Rugrats character. But these days, the Athens, GA based group is sticking to this one: "I first tried to name the band Invisible Boyfriend," giggles singer-guitarist Graham Ulicny. "And everybody goes, ‘that is the stupidest name I have ever heard in my life." So why Reptar? "It is the second stupidest band name we have ever heard." Indeed, there is no pretense behind Reptar, which also includes Andrew McFarland (drums), Ryan Engelberger (Bass), and William Kennedy (analog keyboards). Still, the ability to amuse and arouse their fans is just as important to them as indulging their musical curiosities. This sonic wanderlust extends from African Music to post-punk to psych-pop and converges joyously in songs such as "Blastoff" and "Rainbounce," and it's won them high fives from NPR and NME alike. If Reptar had a superpower, it'd be the knack for warming up every space they inhabit. "Our music is very physical," says Ryan. "We always try to get people moving." This is wired into the DNA of the band, which honed its chops on house shows and continues to keep them a central part of its life. These shows began three years ago when they moved into a teetering, buttercup yellow abode together. "It was slanted at a 20-degree angle," Ryan explains, "and we'd have shows in the front room." Word spread, and soon they were popping up around at other houses, then clubs. Reptar even rounded out their stint at last year's SXSW by playing in a friend's backyard. Impressed by this commitment to connect, NME later rhapsodized about that bouncy set performed on a flatbed truck, anointing Reptar one of the "biggest buzzes" at the festival. "Little kids were running around selling cupcakes to drunk people for exorbitant amounts of money," marvels Graham. Reptar, of course, played for free. The 7th St Entry will also have Icky Blossoms and the mysterious Downer Pussies as special guests for the night. Icky Blossoms bloomed from the blizzards of 2011 in Omaha, NE. Consisting of three multi-dimensional artists, Derek Pressnall, Nik Fackler and Sarah Bohling, Icky Blossoms draws from old friendships, rhythmic experiments, and a love for robust melodies to create music stretching from hazy pop to pulsing dance. Music that feels familiar yet so unfamiliar, like the sun heating your face, old haunts, or falling in love. Sounds Like: White Arrows, Givers, Suckers, Dale Earnhardt Jr. Jr.